Here is the initial planning for the radiator bracing. The round bars that are crossed are just there for bracing the front end temporarily (to keep it straight). I will leave out the sheet metal that is normally behind and below the spare tire. I'm framing the area with square 3/4" tubing. I will triangulate the corners for strength and keep this whole front end square. My plan is to make this area generic enough that I can use many different radiators (if needed) I will (hopefully) just have to make new radiator mounting brackets that will bolt to these cross bars. Here is my new radiator (its aluminum made by Mishimoto for a Honda Civic) The copper 90' fitting is there representing the shape of coolant hose I'll have to find. 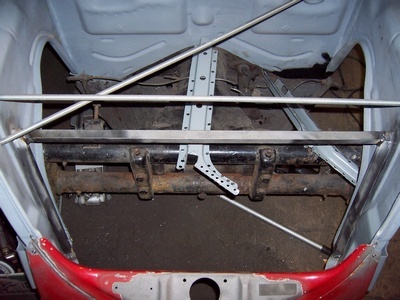 You can see here the cross bar in front and the cross bar below that I will build the brackets onto. I plan to close this top section all in with either aluminum or fiberglass. 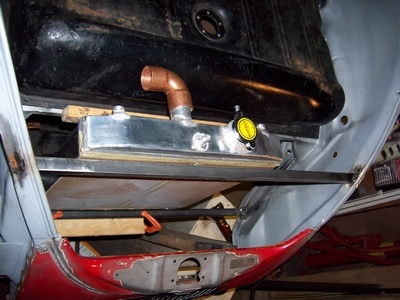 Air flow will come from the entire open floor, plus vents that I will weld into the front apron. Coming next! 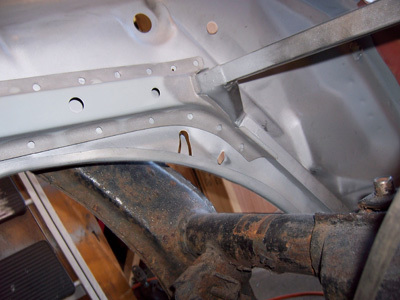 Here is the detail of strengthening the corners. I'm integrating the original gas tank support into the bracing. 13) Front tear down time!